Lula Magazine Loader For AK47 and Galil Magazines. 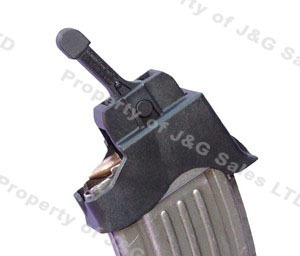 This is the famous LULA magazine loader for the AK-47 and Galil mags in 7.62x39. Black composite, new in package. Easiest way to load AND unload your mags, eliminates thumb pain. Love it, so much easier and faster to load mags. works slick: ingenious design, fast to load the mags and no sore thumbs anymore!